Remember when blogging was new and you could catch up on your favorite blogs over morning coffee? Now there's so much good stuff out there that there's no way in heck to keep up with it all (though syndication feeds are certainly a help), and I'm even falling behind on keeping up with blogs by friends. 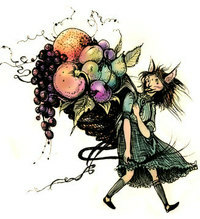 Case in point: I only just found out that Kim Antieau has been posting wonderful little interviews with other mythic-arts writers on her newly re-designed blog; she's got interviews with Alice Hoffman, Charles de Lint, Joanna Harris, Jane Yolen, and poet Jimmy Santiago Baca so far. She has also posted an intriguing interview with herself in which 60 writers, editors, family members and friends asked the questions. You can read some good snippets from the interviews below, and go here to check them out at full length. They are little gems. 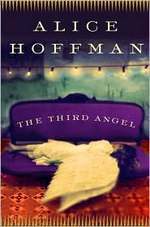 Kim to Alice Hoffman: Like many fairy tales, your stories often begin with catastrophe. Terrible things happen to your characters and to the people around them. Is it difficult to be a witness to these tragedies, as the writer? Is this emotionally draining for you as you are writing it? Or is it cathartic? Or neither? Alice: It's cathartic to take straw and make it into gold, or as close to gold as you can get it. Also to transfigure reality and expand it. 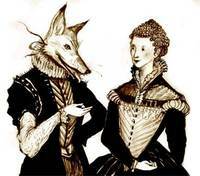 Terrible things happen in all fairy tales -- why not? They are the most honest of all literature. 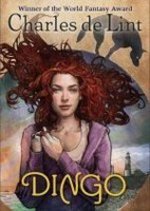 Kim to Charles de Lint: Are you ever unsure of yourself or your writing? Charles: All the time. I think a good writer is a mix of confidence (sure that what they’re writing is going to appeal to their readers) and uncertainty (what if all these words are crap?). If you’re too confident, you get an attitude that seeps through into your writing, affecting the characters and the story. If you’re too uncertain, you’ll never finish anything. Kim to Joanne Harris: Alice Hoffman says you can tell something about a person by which book they prefer: Wuthering Heights or Jane Eyre. Which book do you prefer? Why? 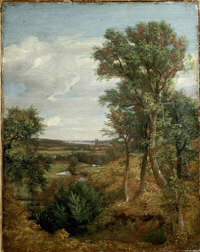 Joanne:Wuthering Heights; partly because I live within a stone’s throw of the place, and the landscape has shaped my childhood, and partly because of the raw poetry of the writing and the extraordinary insight the author shows into the darker mysteries of the human heart – an at such a tender age. Fantastic.
. . . And on another subject entirely, there's a good article posted on Salon.com today about Ursula Le Guin's new mythic novel, Lavinia. 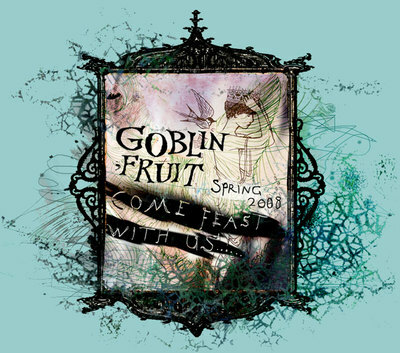 The Spring 2008 (2nd Anniversary) issue of the Goblin Fruit poetry webzine is now online, and by god is it a spectacular one. "In the grand tradition of launching from new and exciting locales," they say, "this Spring issue is brought to you from the Levant with cedar twigs and a handful of Damascene dust. These poems are wet, deep and sea-salted, sure to leave you breathless as a mermaid's kiss and just as doomed and desperate. Read them with caution, and make sure you know how to swim, first -- or don't, and see what dreams may come." The issue is divided into The Book of Breath and The Book of Thirst, with so many fine poems in each part that it's hard to single out just a few for mention. Fans of fairy tale poetry should be sure not to miss "Prince Among Frogs" by Anca Vlasopolos, "Twelve Dancing Princesses" by A. Harvey-Fitzhenry, "Things in the Well" by Erik Amundsen, and "Godmother" by Anna Marie Catoir. Among the mythic poems, "Nesting" by Dana Koster, "Drowning Downstream" by Deborah P. Kolodji, "Noah's Daughters" by Virginia Mohlere, "Rusalka" by Julia Rios, and "Seeds" by Jasmine Johnston stood out for me, but all the poems are well worth perusing. And as is if all these treasures weren't enough, there's also a special feature on Catherynne M. Valente, with an interview and four of her poems. 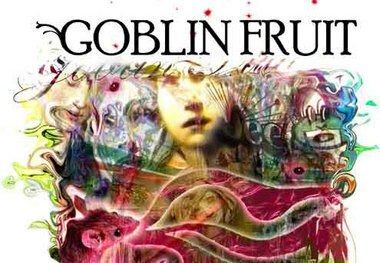 Goblin Fruit (produced by the international trio Amal El-Mohtar, Jessica Wick, and Oliver Hunter) just gets better and better. We wish them a very happy 2nd Anniversary! 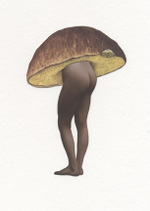 Following up on our feature on Amy Ross, Amy now has a new blog showcasing her work: Nature Morph. Check it out for information on her upcoming shows in Portland, Boston, Atlanta, and Miami; for fascinating images of works-in-progress; and for metamorphic mushroom imagery like the picture on the left. Great stuff! Just wanted to give another round of thank yous to Colleen Mondor, who set up last week's fabulous Summer Blog Blast Tour of 50 Authors. The whole project was incredibly informative, insightful, and inspirational, opening the door to a new and dynamic way to meet authors and read about their works. "I began organizing the Summer Blog Blast Tour a couple of months ago, for reasons I explained earlier. I had hopes that it would introduce readers to authors they have not been aware of and give them some insight into how some of their favorite books were written. I envisioned lots of jumping from site to site as readers followed the daily link lists and became more and more interested in what the SBBT was trying to accomplish. 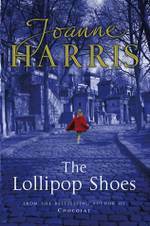 I thought I might hear from some authors or publishers who found our work to be worthwhile. I thought we might connect with a few people - I hoped we would. 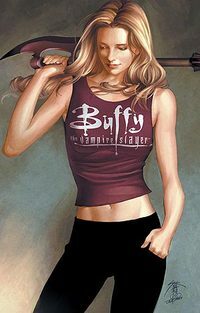 "But really-- I had no idea we would hit this one so incredibly freaking far out of the litblogosphere ballpark...."
Buffy is a show that I dearly wish had been around when I was a teenager, and I envy all the young girls (and young men) who have grown up with its heroine and her friends as archetypes. As if that wasn't reason enough to love Joss Whedon, please read his recent blog entry on women and violence on the Whedonesque website. (With thanks to Emma Bull for the link.) It's utterly spot-on: both heartbreaking and a rousing call to action. Bless you, Mr. Whedon. And if you want to know more about what you can do about violence against women and girls around the world, go here. Congratulations to the very talented trio of Jessica Wick, Amal El-Mohtar, and Oliver Hunter for another splendid issue of Goblin Fruit, the tasty and handsomely illustrated online poetry journal. This spring issue marks the one year anniversary of their fertile collaboration -- made more challenging by the fact that the three live spread out across the globe. Of the current issue Amal writes: "We wanted this issue to have a tang of salt air and loam to it, a feel of both drowning and digging; expect to find anything from dismembered elves to devoured dryads. There are maenads and mermaids and fairy princes; there are weddings, gods, frogs and ships (in no particular order), all dancing together in a way that I think would do Lewis Caroll proud." This is another terrific collection of poems (those highlighted with a red leaf have an audio option). Among them, Karen A. Romanko, Casey Fiesler, and Karen Berry give us mermaids as drowned daughters, an awkward mermaid on a metro, and a poignant retelling of Ariel's fate from "The Little Mermaid." J. C. Runolfson writes a chilling poem of Green Jenny, a ghostly water sprite, while Kirsten Anderson celebrates the fantastic marriage between the land and the water. Catherynne Valente and JoSelle Vanderhooft plow new furrows in old myths and fairy tales. 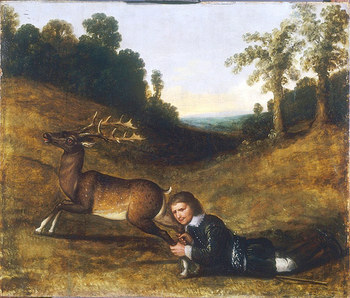 As a bonus offering, the issue also presents the winners of the Faerie Queene Poetry contest which treated the subject of the Faerie Queene and Queen Elizabeth. It was my pleasure to be called in as the tie breaker at the last moment. First place went to Samantha Henderson for her wonderful ballad-like poem "Queen Elizabeth and the Fox," second place to Felicity Maxwell for "Corona Reginarum," and third place to Marcie Tentchoff for "Fair Price." And as always, Oliver Hunter has illustrated the issue throughout with his sketches and paintings featured here in this post. You can see more of his remarkable work on Endicott in "The Mage of Muse Hill" and "Traveling the Wilds." Back in November, we profiled the work of multi-media artist Meg Fox, looking at the ways she and other writers and artists use fairy tale themes to discuss the difficult subject of child abuse. Now Meg has written to say that she's started a new blog specifically for this kind of work: Healing Through Visual, Literary and Performance Arts. 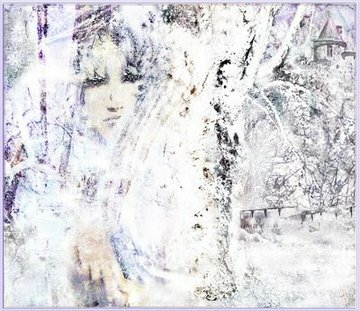 The art above is one of the new pieces featured on the blog, based on The Snow Queen by Hans Christian Andersen -- a writer we were speaking of just yesterday. In light of yesterday's discussion in the Comments section of the Hans Christian Andersen post, Eisenberg's description of Kay's experience caused me to think about Kay's story in a new way: as a metaphor for depression. I'd always viewed Kay as simply cut off from love, like a lover who has turned suddenly cold when his affection has been transferred to someone else. 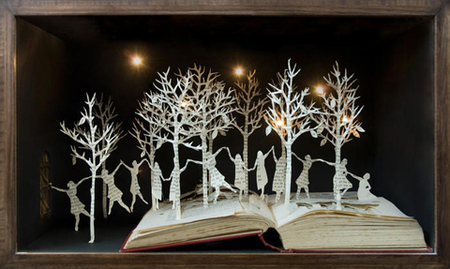 (Sandra Gilbert's Snow Queen poem cycle is a wonderful exploration of this interpretation.) And yet, another reading of the tale is that young Kay is cut off from life itself, from all feeling and all pleasure...which evokes the painful experience described by sufferers of clinical depression. This is what I love about fairy tales -- that there are so many different ways to read them, some of which their various tellers and authors intended, and some of which perhaps they did not. They also contain much food for thought concerning the process of healing and transformation -- not only for those who are putting their lives back together after traumatic childhoods, but for everyone who has been scarred by life in one way or another. Here's another essay in the Endicott archives on the healing power of myth and mythic fiction: The Dark of the Woods; plus I'd like to recommend Midori's powerful Armless Maiden article once again. 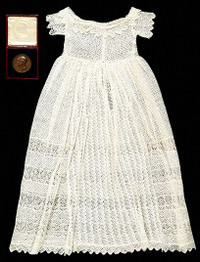 The afore-mentioned Snow Queen cycle of poems by Sandra M. Gilbert can be found in her collection Blood Pressure, and Adrienne Rich's poem "The Snow Queen" can be found in The Fact of a Doorframe. 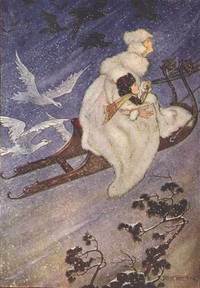 The Snow Queen by Eileen Kernaghan is a gentle YA novel that brings elements of Scandinavian shamanism to Andersen's tale. The Ice Queen by Alice Hoffman is a magical contemporary novel that draws imagery from The Snow Queen, among other fairy tales. 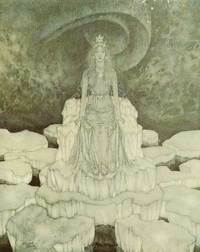 And, of course, there's The Snow Queen by Joan Vinge, a classic work of science fiction that draws on themes from the fairy tale. 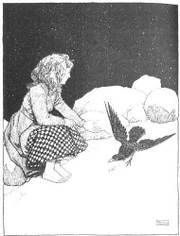 You can read an annotated copy of Andersen's original tale over on the Surlalune Fairy Tale Pages, and also see Snow Queen illustrations from the 19th & early-20th centuries. The art in this post is by Meg Fox, Edmund Dulac, Arthur Rackham, Milo Winter, and W. Heath Robinson. The Radio Ballads project that we discussed yesterday reminded me of another ground-breaking interstitial arts project examining historical and contemporary life in Britain: Memory Maps. Created in collaboration by cultural historian (and fairy tale scholar) Marina Warner, the University of Essex, and the V&A Museum, Memory Maps is an internet-based project focused on the relationship between people and place. In her introductory essay, Marina Warner writes: "A new genre of literature has been emerging strongly in recent years. It doesn't belong automatically on any particular shelf in a bookshop, or to a particular category in a library catalogue. Writers working in this vein are exploring people and places and the relations between them, and in order to do so they combine fiction, history, traveller's tales, autobiography, anecdote, aesthetics, antiquarianism, conversation, and memoir. Mapping memories involves listening in to other people's ghosts as well as your own....Memory Maps is a website designed to inspire and foster work which will continue this approach to writing by providing focal points of interest - catalysts of thought - in the form of paintings and artifacts, alongside databases about people and places." 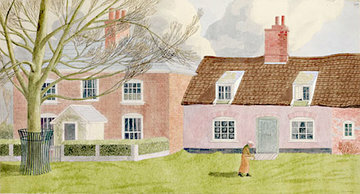 The Memory Maps project begins in Essex, England, one of the oldest inhabited parts of the British Isles. 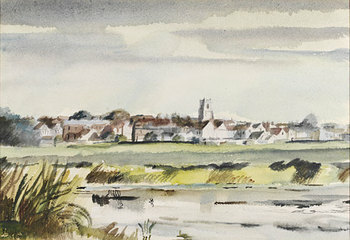 The project organizers began by collecting images of Essex and asking a wide range of writers for their responses -- including poet & film-maker Ian Sinclair, ecological activist Ken Worpole, musician Billy Bragg, poet Angela Livingstone, novelists Michele Roberts and Lisa Appignanesi, and numerous others (with A.S. Byatt still to come). The project then invites you, the reader, to "respond and contribute, stitching new thoughts, dreams, history, and stories into the map." The form of writing they are chiefly seeking, Warner explains, comes from an old, very English tradition "of the personal, even eccentric essay, the wide-ranging, meditation, and the anecdotal almanac.The precursors of Memory Maps include Robert Burton and The Anatomy of Melancholy; John Aubrey and Brief Lives; Sir Thomas Browne who investigated local beliefs and rituals, ancient and modern; Samuel Taylor Coleridge, most aleatory of English conversationalists on paper and in person; Thomas De Quincey, who forged a new kind of impassioned personal testamentary essay; and others: this is another zone of exploration. "As the Memory Maps grow," Warner concludes, "they will go on connecting different people and places across time and in the present. Such an exchange between images and writings, past and present, memory and imagination, releases energy: the energy of stories." Click here to learn more about Memory Maps, and how to contribute to the project yourself. And click here to listen to Billy Bragg's contribution, the song "A13, Trunk Road to the Sea". Kim Antieau has posted a lovely new story, "Sister Sophia and the Drifter," on her Church of the Old Mermaids blog. (Read our November 24th post explaining the Church of the Old Mermaids project here.) The story was written at the Endicott West arts retreat in Arizona, where Kim and her husband, poet Mario Milosevic, are staying again this winter. 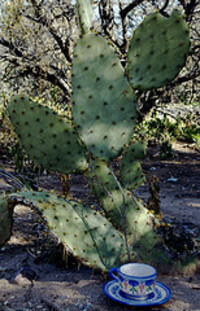 You can read about their daily adventures in Arizona on Kim's The Furious Spinner blog (and catch a glimpse of a Sonoran desert bobcat!) Speaking of Mario, check out his Terrastina and Mazolli blog, which is a serialized novel (in daily 99-word episodes) about a year in the life of a fictional Northwest couple and their twin daughters.